Money in the Garage: Make money with Facebook ! Why yes I am a FB yardsale groupie. I once belonged to 10 different groups, but have whittled it down to 5. Early spring I went on a huge craft supply and small household decor purge. I made $250 over 2 weeks. Now that the weather is cooler and I can get back out into the garage, it is time to purge once again. Woudl love to hear about more of your FB flips to keep me motivated. oliveoyl64 - Wow! Ten FB groups? I couldn't handle all that...I'd never get anything done-ha! I guess that's why you whittled it down. FIve is still a good amount though. And $250 in 2 weeks? That's awesome, now you're motivating me! But, for sure, as I do some more FB flips, I'll share them on the blog. Keep plugging away on your groups and feel free to share some of your biggies with us. My FB experience has been completely different. I am happy it is working for you! I posted packages of brand new diapers (I thought I was going to have another baby...but nope) so time to sell those items. I had 58 people, yes you read that correctly, 58 people write SOLD on the item and NOT ONE PERSON contacted me to pick them up. I even listed my phone # and address on the posting. I could not believe it. I finally sold the diapers a couple of days later and two people contacted me within 1 min of each other. I sold the entire lot to the first lady and this other guy wrote me 15+ emails yelling at me and saying he was going to turn me into the admin because I did not sell them to him. It was horrible! I kept my emails nice and just kept saying I am sorry, you were one minute later than the other person and have a good day. Holy cow was this guy mad! Craiglist has been much better for me and I will stick with that. Suzy- That's amazing that all those folks passed on it. I am starting to see that every group is a little different in their tastes, what's posted and what's bought. Mrs. Dude posted a Pandora bracelet on our local FB yard sale group received absolutely zero interest-not a one! . She re-posted the same bracelet on a nearby town's FB group and received five people interested in buying it. She sold the very next day for $20. Like I said, what a difference. It's amazing! Anyway, don't kick FB to the curb yet. Try different items and see how you do. Suzy- That's great. I am glad it worked out. Keep plugging away at it, especially now that the holiday buying season is here...Dude! I've seen folks on various FB yard sale websites with the same complaint about condition. Kind of a bummer to drive all the way to a front porch and find the item isn't what you expected it to be. But I think at that point I'd walk away from the deal. 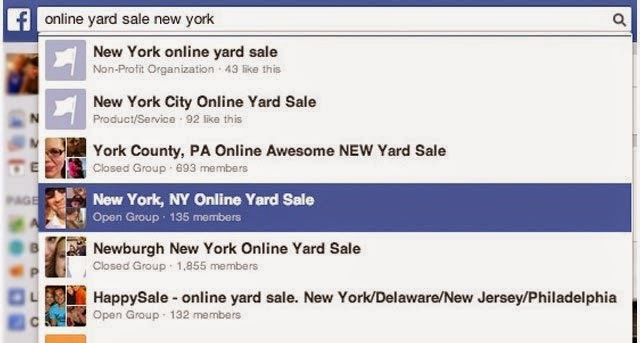 I've also noticed that people have a tendency to ask more for their items on FB, then they would if they had an actual yard sale. But there other listings that are good deals, so I try to jump on those when I can. Like you, I am also trying to unload Ebay "duds" via FB. So far, its been hit or miss. But I usually get an eye roll from Mrs. Dude when I ask her to list my duds. She likes to monopolize all the listing for own stuff - lol! Grace- I hear ya. Some FB sellers way overprice their stuff. I think they see what other folks are asking and think "me too". The local FB yard sale page consists mostly of moms selling their kids stuff, household items, purses and clothes. That's fine but if I post a "guy" type thing, more then likely, it ain't moving. So you have to know your market I guess. My husband and I have been selling on Facebook for about a year and a half now, and have had great success. Our most recent big score was a tub of "junk" from a auction, we spent 15.00 on it, and so far our profit has been $135.00 and counting! All sold in a matter or days. Another big money maker for us was when we bought 10.00 of golf balls at a garage sale and made a profit of 90.00, again in a few days. This week alone we have sold over 500.00. I find it easier and faster to sell this way compared to selling on ebay. I am embarrassed to admit that I belong to about 15 different groups, but sell on only about 5 of them. Wow-Nice! you're taking FB to it's full potential! And you got me thinking about golfballs, I see buckets of them at yard sales from time to time. May need to explore that some more. I agree with the ease of selling on FB. Where else can you have buyers come right to your door and slip money under the welcome mat? You gotta love that! Thanks for sharing your FB story....Dude! I did belong to a couple of "free/gifting" groups, but decided to leave ALL of them. It started to feel like people were expecting to furnish their entire home for free. I am all for helping people out but it got rediculous. I only had one "flake" in all the transactions , so I blocked her. I am even willing to drive a short distance and deliver so I think that helped my sales. I had offered a desk for "free" but earned $20 in gas money b/c I offered to deliver, so still made a profit on a freebie. $20 bucks is nothing to sneeze at, right? Nice way to generate some cash out of the free deal. You delivered it, so you earned it! Never checked out the free groups on FB. Have looked at the free section on Craigslist though. For the most part, seems like mostly outdated furniture, "firewood" (recently fallen trees or pallets) and nasty looking fish tanks. But I guess if you're diligent, something good shows up occasionally. Thanks for the "Freebie" story....Dude! I too am obsessed w the fb groups. I belong to about 5 or 6. We bought a house in may and we are in need of so much stuff. Yesterday I met a lady and bought a papasan chair for the playroom and some heavy duty shelves for the garage for just $20. I have to admit that I have started a small inventory of things to sell on eBay but haven't yet started BC I'm a little scared. I read a lot of flipper's blogs so I know what to BOLO for. I already sell at consignment sales twice a year but would like to get rid of the Middle man. Back to selling on FB, I haven't done that well so far, but yes, I am checking my new smartphone often BC I don't want to miss a great deal! Dana-With you following 5-6 groups, you should fill your house pretty quickly. Let us know if you makes some great scores. for eBay selling or your house. I used to buy a lot and resell it on ebay in the early days of the groups. Now everyone is pricing their stuff to high for resale but ok if one were keeping it. I had a lamp posted for 3 months on mine and then posted it on the other and it sold that same day for $30. Last night I sold my old desk for $25 I have also sold a Harley jacket for $50 that was sitting on ebay for months. I would guess being an administrator can eat into your time. Not an easy job, so hats off to you for tackling it. Our local FB group has about 4000 in it and stuff just flies down the feed. With so much activity it can be annoying if you're trying to go back to look for something. I agree with you on the pricing, I've noticed people charge more then had they sold it at their own yard sale. I think one reason is they don't have to be face to face with the buyer, so why not jack up the price, right? Ha! For example I never seen pair of Ugg boots for less then 30 bucks. At a yard sale I've scored them for 5 to 10! Your $6 dollar buyer sounds like a pretty nervy lady. Hopefully, she's a rarity though-Ha!